Originally appeared in the September 13, 2012 edition of the Southside Times. It was probably during my fifth or sixth month in my first job at a Mexican restaurant that a cook named Frankie beckoned me to the back of the kitchen. This was near closing time, and I was at the helm of the expeditor’s station. I didn’t know what Frankie—a big-shouldered guy with haphazard facial hair and a childlike chuckle—had up his sauce-spattered sleeve; but I was suspicious of the mischievous glint in my amigo’s eye. 1. Dice steak into small, bite-sized cubes and place in non-reactive bowl. Add in oil and lime juice, coating steak thoroughly; allow meat to marinate in refrigerator for at least four hours. 2. Meanwhile, in a bowl combine onion, cilantro, and lime zest along with a small pinch of kosher salt and cracked black pepper. Set aside. 3. Place a wide-bottomed sauté pan over medium-high heat; season steak with a small amount of salt and pepper before adding to hot pan. Sear meat thoroughly on all sides before removing from heat and allowing to rest (for about 7-8 minutes). Place a separate sauté pan over medium heat and lightly toast corn tortillas on both sides. 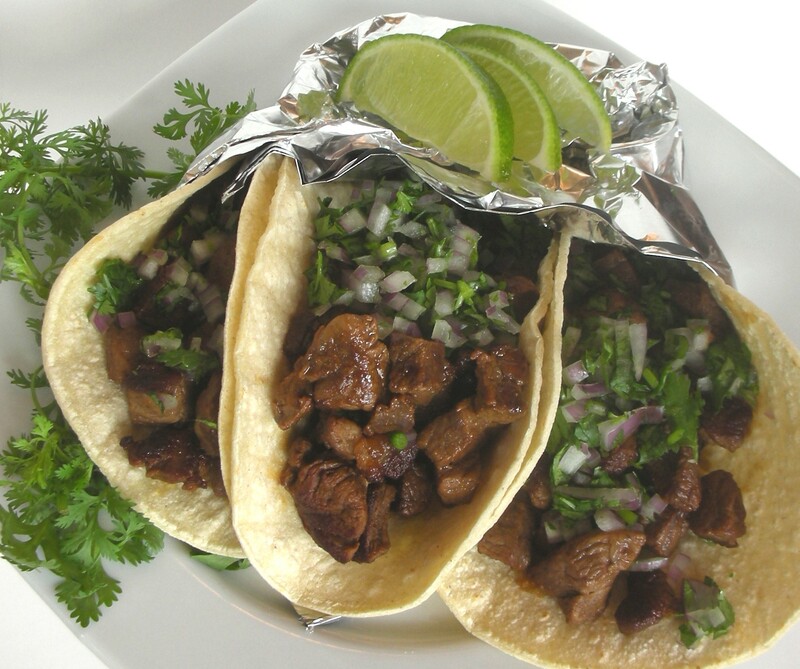 Fill the tortillas with seared steak, top with cilantro along with a generous amount of fresh lime juice. Originally appeared in the May 17, 2012 edition of the Southside Times. The popularity of Americanized “street food” continues to grow. There have even been television shows solely dedicated to fare on-the-fly. And throughout Indy, trendy food trucks act as a veritable “Where’s Waldo?” of catch-it-while-you-can service. 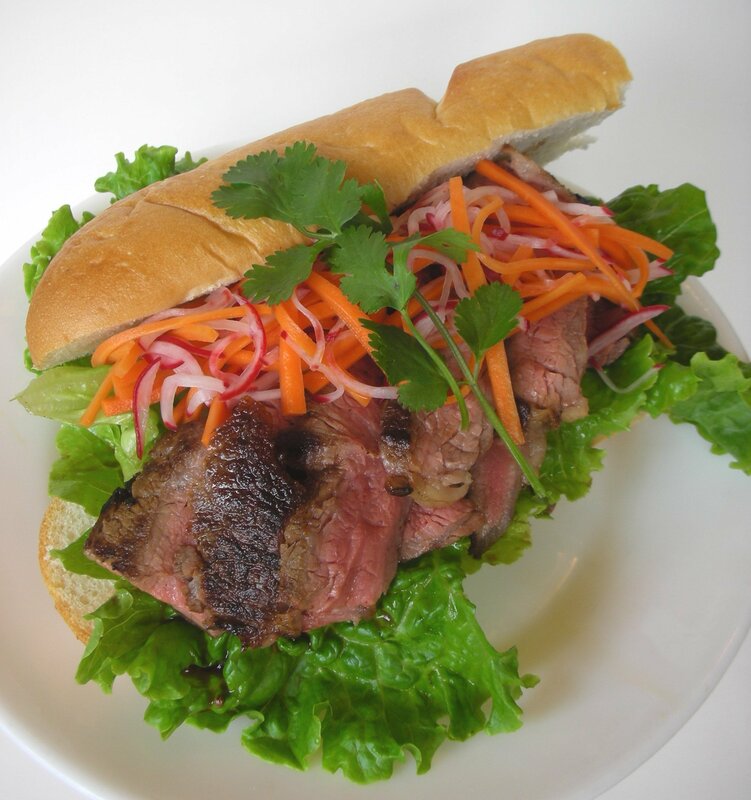 The Vietnamese sandwich bánh mi has a long tradition of providing humble comfort with economic ingredients. But it’s literally the idea of a sandwich—an amalgamation of flavorful ingredients, book-ended between bread—that holds it all together. For this variation, I’ve assembled a bánh mi with marinated, thinly-sliced strip steak, paired with a radish and carrot pickle mix. Prep your marinade and brine ahead of time so that when it comes to construction, you can operate just as quick as one of those lightning-fast street food vendors. The red leaf lettuce provides a cool, crisp crunch, and the cilantro chimes in with notes of citrus. As always, I encourage you to cobble together your own permutation. Classic “body” fillings include barbecued pork, meatballs, grilled chicken, sardines, fried eggs, and tofu (just to name a few). And use your imagination with the condiments—heck, if pâté tickles your fancy, go for it. Whether it’s slow-at-home or on-the-go, bánh mi is about combining comfort. 1. Combine marinade by whisking in a bowl. Place trimmed strip steak in a plastic storage bag and pour in marinade. Allow to marinate for at least four hours (overnight is ideal). Prepare your remaining sandwich toppings. 2. For pickle: Combine vinegar, ¾ cups sugar, and water. Place carrot and radish in a bowl and sprinkle on salt and 2 teaspoons sugar. Use your fingers to “massage” the vegetables, rubbing the coarse salt and sugar into the vegetables. Carrot and radish will begin to render liquid and go limp; continue for 2 – 3 minutes. Strain under cold running water to wash off salt and sugar. Pour brine over pickle mixture and set aside (preferably for a few hours). 3. Pan-sear marinated strip steak over medium-high heat. Cook until you’ve achieved desired doneness. Slice thin and pile onto baguette bread with lettuce, cilantro, and carrot-radish pickle mix. Originally appeared in the March 22, 2012 edition of the Southside Times. For this fourth installment in this kid-centric series, I had my mind set on some sort of sandwich. And to avoid the same old, same old, I set my sights on introducing the little ones to a unique sort of bread—mantou. You likely won’t find this at your local market, so it will take an investigative trek to an international market. But like so many of these little adventures, it’s unceasingly rewarding. Mantou is a yeast-leavened bun, similar to bao (pronounced bow), a sort of stuffed bread popular in Chinese cuisine. The buns are usually steamed, producing a delicate dough yielding an enjoyably chewy texture, and its fermented flavor is mildly sweet. In the midst of your gastronomic quest, steer toward the freezer section of the store, where you’ll find a host of frozen rolls and doughs—of both the stuffed and plain varieties. The turkey is, of course, lean, so I’ve added in a little hoisin sauce as both binder and flavor component. And I won’t even get into the host of toppings you can pair with these burgers—the sky’s the limit. Combined, these elements create a kid-friendly sandwich that’s predictable enough to be pleasing, while abnormal enough to be enticing. 1. Preheat an oven to 375 degrees. In a large bowl, combine 8 ounces of turkey with hoisin sauce. Add a small amount of kosher salt and pepper. 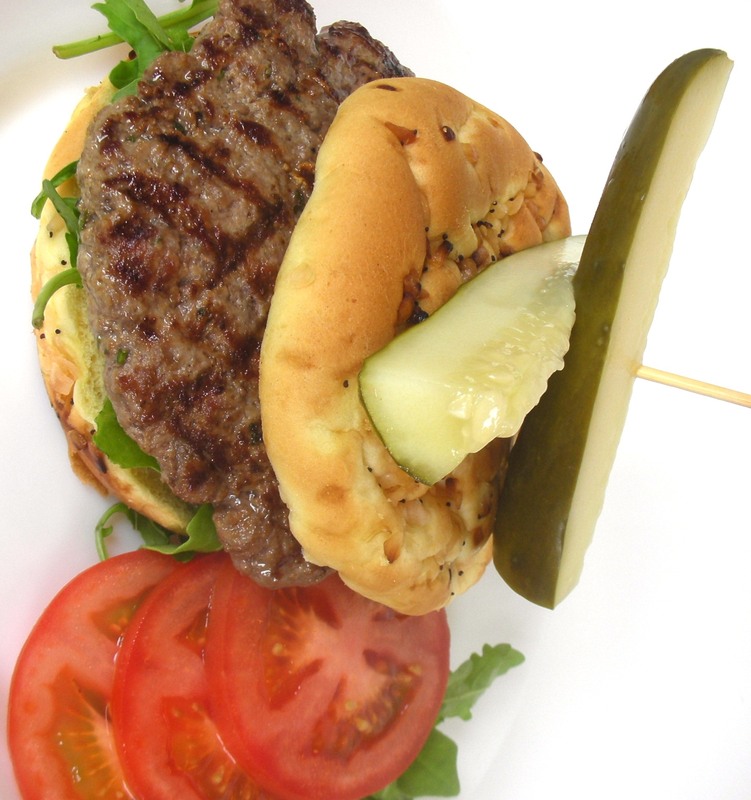 Divide meat into 2 portions, and shape portions into patties. In an oven-safe sauté pan over medium-high heat, add a small amount of canola oil. When heated, add patties one at a time, searing to golden brown color, reserving the cooked one on a plate. When patties are cooked, put back in pan and place pan in oven to finish cooking (12 -15 minutes). 2. Meanwhile, place mantou buns in a large freezer bag; seal halfway, allowing an open portion to release steam; cook for 30 – 40 seconds, or until buns have softened. Set aside. 3. Now make parmesan wafer: In a small bowl, combine parmesan with just enough flour (a few sprinkles) to coat the cheese. Using a non-stick sauté pan, place half the parm mixture flat in the center, making a wafer-thin disc. When wafer has started to get crispy (about 40 – 60 seconds) flip with a spatula. Set wafer aside. 4. 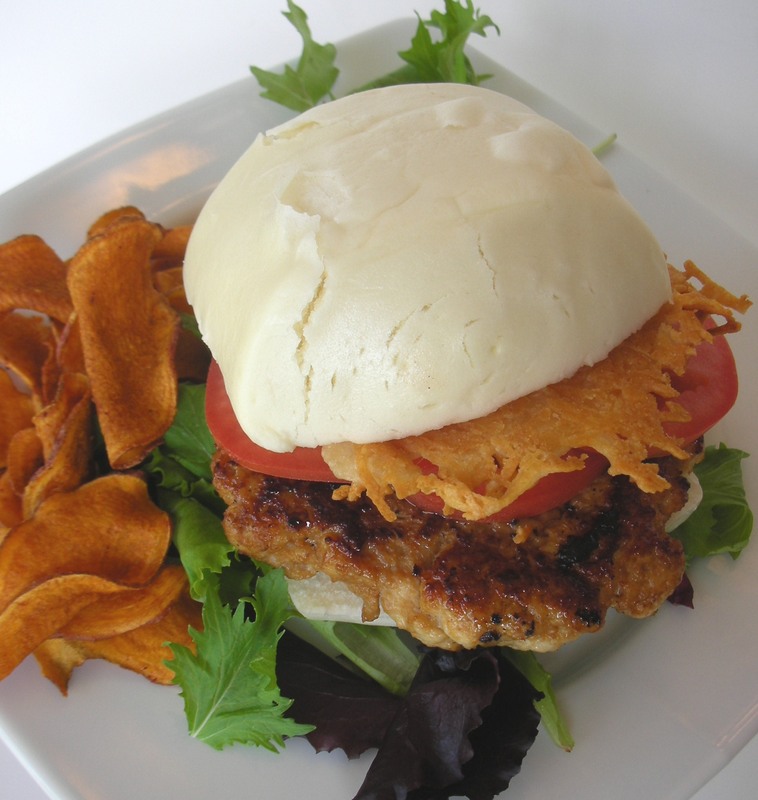 Slice mantou buns and proceed to assemble sandwiches—turkey patty, parmesan wafer, and choice of toppings.